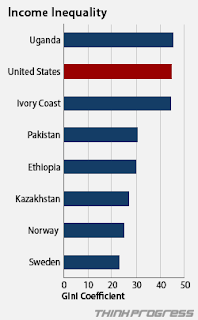 Clear Stream Media: Eye Popping Charts that Show How Our Richest 1% Is Out of Control! 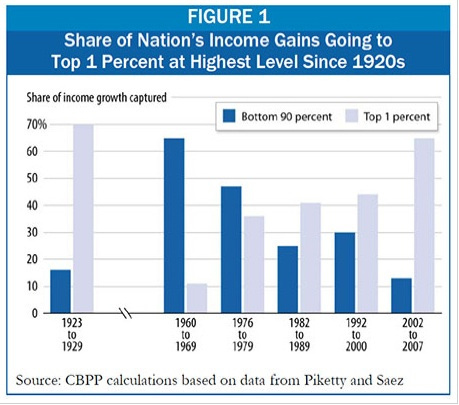 Since 1980, 4/5 of all the increased income in our country went to the top 1%. 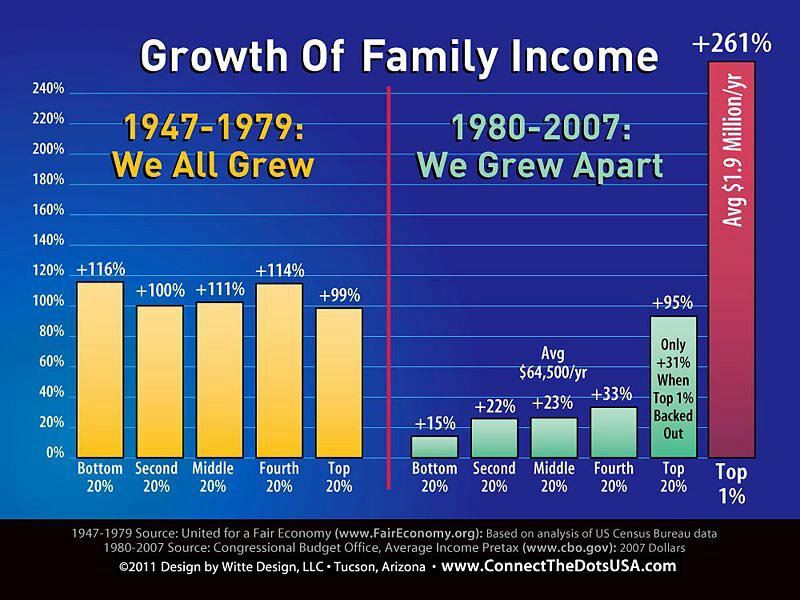 Many like to point to the Reagan years as being so prosperous- yeah if you were part of the richest 1%. 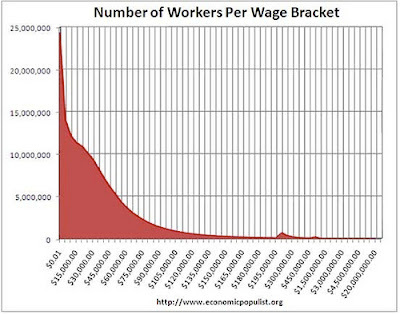 Wages for the rest of us have pretty much stagnated for the last three decades. There is class warfare in this country and as Warren Buffet has said, his class is waging it and they are winning. Yesterday, Senate Republicans voted NO on a bill that would have created or saved 400,000 teacher and first responder jobs.. It was going to be paid for by increasing taxes a half of a percent on salaries over $1million a year- So if you made $1.1million you would have paid an extra $500. But for the GOP that was too much of a sacrifice to ask of millionaires, even if it put 400,000 Americans to work. The GOP says we cannot tax the mega wealthy any more at all, in fact they want to increase cuts to the richest 1%, because they say they are the "job creators". Really? Well, they do bankroll and therefore create their own jobs. So here is just one example of what the uber-rich do when their profits go up- they cut jobs- to amass yet even more outrageous profits! 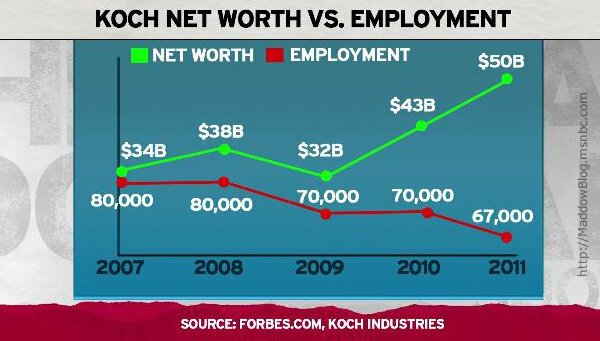 We have had reduced taxes for the richest among us for 10 years- what has that done for job creation? 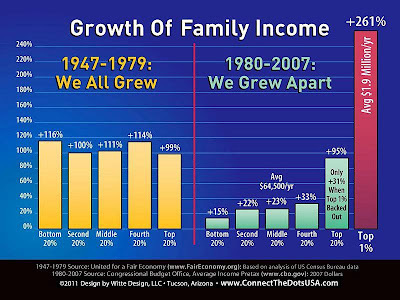 There has been a massive transfer of wealth from the poor and middle class for three decades. Many members of the Boards of Directors of major banks and corporations in our country serve on multiple boards. "Interlocking directorate" refers to the practice of corporations sharing directors. From Wikipedeia- "Interlocks allow for upper class cohesion, coordinated action, and unified political-economic power. 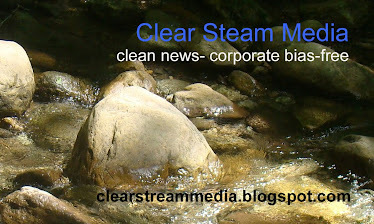 They allow corporations to increase their influence by exerting power as a group, and to work together towards common goals.They help the upper class maintain a class advantage, and gain more power over workers and consumers, by reducing intra-class competition and increasing cooperation." This allows the upper class to raise executive compensation to obscene levels, even if thousands have to be laid off to do it. The bottom 90% have less of a share of the pie today than we did leading up to the Great Depression! These numbers have very real and tragic consequences for the 99% of us. 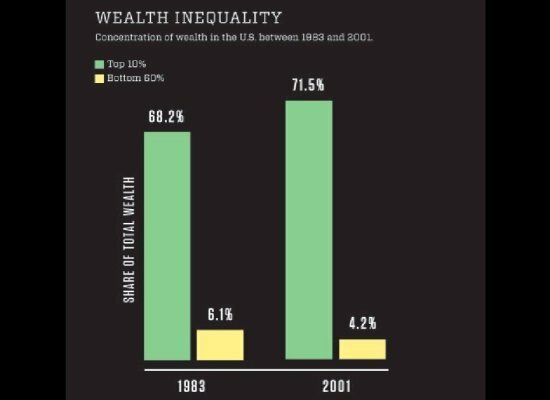 This is why we are rising up- to reverse this dangerous and undemocratic inequity and to demand economic and social justice for all Americans! Occupy Everywhere! Yes, I think the first one sums it up best- for decades all in America enjoyed prosperity which is what made our country great! Now the standard of living for 99% is declining precipitously while the richest 1% consolidate wealth and power. No democracy can survive such disparity! Occupy Wall Street, Kingston, NY! Thousands at Occupy Wall St in Foley Square! Thousands to Join Occupy Wall St Wednesday!